An excited Alvin Robins is all smiles as he shows off his cheque for $38,014 from his recent Lucky Pick win. PHILIPSBURG–Caribbean Lottery has paid out more than US $108,000 to one Lucky Pick and two Pick 4 winners. A few days ago, Pick 4 player “I.B.” won US $40,000 with lucky number 1941. B. bought the same number again and secured another US $20,830. This lucky number represents the year his father was born. ”I.B.” is extremely grateful for his wins as he was able to complete a project and he looks forward to greater financial plans. “My project was able to be completed with the winnings I had before. With this win, I will look into other possibilities of investment,” the winner said. 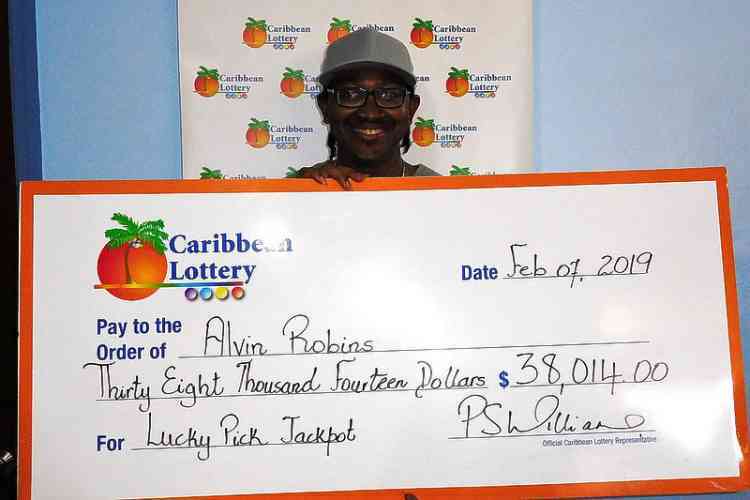 Alvin Robins joined in on the winning streak with Lucky Pick. Going away on vacation did not stop Robins from playing his favourite game as he asked his agent to play his numbers in his absence. Victor is extremely excited and grateful for her win. She intends on saving the money while she properly plans how she wants to spend it. “This amount will allow me to do something I could not do before,” she said. Site Operations Manager at Caribbean Lottery Paula Williams was excited for the lucky players. “We are so delighted to share these moments with our players. They have shown much dedication and we are happy to see them reaping their rewards over and over. We are especially happy to know that they will be able to complete major projects and work towards a brighter future.” Williams congratulated the winners and wished them all the best on behalf of the Caribbean Lottery team.